Did you know that the wines of South West France are available to taste for free in London’s very own Maison des Vins du Sud-Ouest? The Maison des Vins is the ‘home’ of wines from the region with a permanent showcase for wines from the South West. The Maison des Vins is located inside the fabulous Comptoir Gascon in Smithfield Market (right), a restaurant specialising in delicacies from this beautiful part of France. The wines on show are made up exclusively from a selection decided by myself and colleagues, who tasted our way through over 200 wines from the South West to find ‘ambassador’ wines to be offered at the Maison des Vins throughout the year. Customers having lunch at Comptoir Gascon will be offered a free taste of wines. Photo © Jean Cazals. 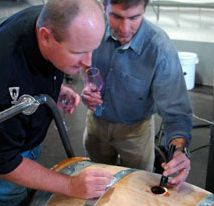 Crushpad Inc. is a US company that offers custom winemaking facilities, allowing wine loveing consumers to have their own wines made, producing anything from one to 1,000 barrels. Crushpad was founded in San Francisco in 2004, and today operates facilities in Sonoma and in Bordeaux. The company has just announced that it has partnered with the Cazes family, owners of Châteaux Lynch-Bages and Ormes de Pez, to expand Crushpad’s services in Bordeaux. Drawing on the expertise of the Cazes family, Crushpad will establish its own winery in the wine-tourism village of Bages near Pauillac. They say: “The new location allows Crushpad to target a broader international audience and also provide a full range of educational and custom winemaking services in a unique home-away-from-home atmosphere. In addition to benefiting from their own winemaking facility and some of the industry’s most experienced experts, Crushpad clients will have the option to tap the full complement of Lynch-Bages’ tourism and lifestyle services.” These include the Cordeillan Bages luxury hotel and two-star Michelin restaurant, Ormes de Pez guesthouse and dining and shopping facilities of Bages village. “We have followed Crushpad’s activities in Bordeaux with growing admiration,” says Jean-Charles Cazes, CEO of Chateau Lynch-Bages. “Crushpad’s model fits extremely well into our wine and tourism activities and offers visitors something truly unique in the industry – the chance to fully experience the art and technique of winemaking and the joy of the end result.” See www.crushpadwine.fr. Staying in France, one of the UK’s most ambitious internet wine retailers, Slurp, has staged an audacious bid to beat the French on their own patch by launching SlurpVin.fr. The company says the French online market is lagging well behind the UK, and that their French arm is aiming high: “targeting a #1 position in French wine, spirit and premium beer online sales within three years.” Launched initially with around 700 products, the company says the range will grow to 2,000+ within three months and then further still by year end and that it will target “the same knowledgeable premium retail customers as in the UK. We expect the inital audience to be younger, affluent French consumers who wish to expand their horizons beyond domestic wines through a modern, dynamic online experience.” For this reason the site will emphasise New World products, many of which are difficult to obtain in France. US auction house Acker Merrall has announced that total results of its second new york auction of 2012 saw sales of $3.6 million, with 97.5% of lots sold. What’s more, no fewer than 59 world records prices were paid for top wines including magnums of 1995 Montrachet and 1999 Romanée-Conti from Domaine de la Romanée-Conti. The great estates of Burgundy and Bordeaux led the way, and bidding in the room, on the phone and via the web was said to be “energetic,” from collectors around the world – most notably Asia, Europe and Latin America. In fact, DRC and Château Lafite-Rothschild dominated all of the top 10 lots. “The great estates of France continue to be the leading force in the global fine and rare wine auction market,” noted John Kapon, CEO of Acker Merrall. “Bordeaux and Burgundy will always be the barometer for the rest of the market, and while Burgundy may have more sizzle at the moment, Bordeaux will always have more steak as the quantity of production is greater. We saw the rest of our Top 25 lots dominated by Bordeaux, led by Mouton Rothschild, Latour, Cheval Blanc and La Mission Haut Brion. Older vintages like 1947 Cheval Blanc attracted significant interest this sale, and there was also strong demand for Italy and California.” Screaming Eagle was the only California wine to crack the sale’s top 25 lots.